As defined by CMS, “this performance category measures health care processes, outcomes, and patient experiences of their care”. Requirements may change each Performance Year (PY) due to policy changes. Find Quality Measures requirements for each performance year of the program here. Explore and choose your Quality Measures on the Centers for Medicare & Medicaid Services (CMS) website here. Explore CMS Resource Library for the most up to date information concerning Quality. 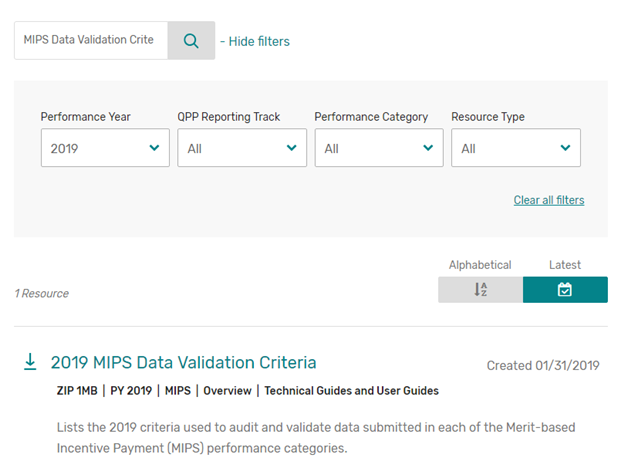 As displayed in the screenshot below, you can easily find files related to Quality by utilizing the search filters to narrow down your search by Performance Year, QPP Reporting Track, Performance Category and/or Resource Type.